Across the road was a install with a lady sweeping behind the stall. She briefly smiled at Avingard and went back to her work. Avingard throught back about just a few moments ago when Jon Battle-Born talked about the local bard Mikael. “Someone giving you trouble?” Avingard asked. What if I talk to Mikael?” Avingard asked hoping to help diffuse the situation with Mikael. With that, Avingard headed to the Bannered Mare, which was located right next to the market. Avingard walked up to the door and opened it. 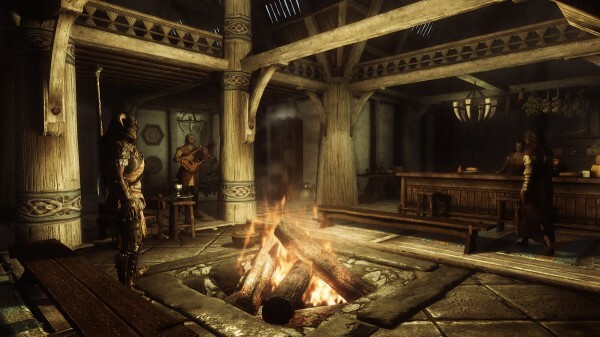 The Bannered Mare was dominated by a large room, with a bar to the right and a large fire in the middle. Several benches were placed around the fire to warm up anyone coming in from the cold. To the left was a doorway that led to a smaller room. A staircase went to the second floor, which was located at the back of the in at the opposite end oas the door. “Come on in. We got warm food, warm drinks, and warm bed,” a lady behind the bar greeted Avingard. “I’m looking for Mikael,” Avingard said as he looked about the room. “I have an issue I need to speak with you about,” Avingard started to say, before being cut off by Mikael. If it’s a lady you’re looking for, you best look elsewhere. Once Mikael gets them, they’re got,” Mikael gloated. “Leave her alone, or else,” Avingard replied as his temper started to rise. “I don’t have to take that from you,” Mikael answered as he dropped his instrument and put up his fists. 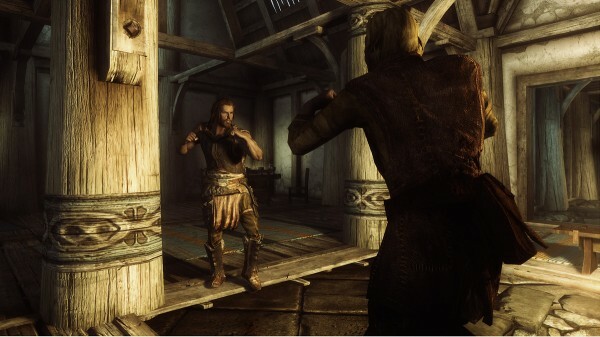 Avingard quickly displayed his fists in anticipation for a fight. Mikael swung his right hand, hitting Avingard in the arm. Retaliating, Avingard swung his right arm, and struck Mikael in the head. The bard stumbled back from the impact of the blow. Before Mikael could recover, Avingard sprung forward with a left hook, knocking Mikael in the opposite direction. Avingard continued the assault with a few more punches to the bard’s shoulder and head, eventually knocking Mikael to the ground. After only a few minutes of brawling, Mikael had had enough. “You leave Carlotta alone, or this gets worse,” warned Avingard. “You win, on my honor, Carlotta won’t have to worry about me ever again,” Mikael agreed. Mikael eventually rose to his feet and picked up his instrument, and began to try and play music. With that, Avingard turned and walked out the door to tell Carlotta.